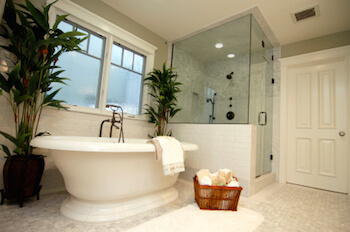 Remodeling your bathroom? Nothing can be more fun then taking on a home project. Adding new trends, new décor, can not only make you happier with your home, it can also add resale value as well. Yet as you are looking at all of the options available to you, its important to keep in mind safety as well. According to the US Center for Disease Control and Prevention, one of the most serious problems we face are the effects from a fall. In fact, with the senior population, it’s the leading cause of fatal injury. And a great deal of those falls occur in the bathroom. Which means choosing the right floor isn’t just about looks and ambiance, its about safety too. There are several flooring choices that offer safety features to young and old. Tile is probably one of the most popular choices for bathrooms, and for good reason. Ceramic tiles look great, last for a long time, are easy to clean and maintain, resist scratches, are resistant to mold and mildew, and come in an infinite amount of color and pattern combinations. Ceramic tiles come in a variety of styles. While some can be safe and perfect for bathroom use, just as many exist that are slippery and very dangerous. Couple a floor with slip tendencies with a floor that becomes wet on a regular basis, and it’s a sure sign for potential problems. When choosing tiles, make sure you choose slip resistant tiles that meet the ADA standards for slip resistance. Most vinyl flooring combines slip resistant with the softness of a cushion backing, giving plenty of give as you move around the bathroom. If a fall does occur, the vinyl backing can provide a little give in the process. Today’s vinyl offers an unlimited amount of options. If you have a particular look or style you prefer, chances are you can find vinyl to match the look. Vinyl can be found to mimic wood flooring, tiles, even more sophisticated products like reclaimed wood, and more. Vinyl is available both in sheet and tile format, making it the perfect bathroom choice, no matter how big or small your room is. Both cork and bamboo are increasingly popular bathroom floor choices because they are attractive, slip resistant, and a renewable resource. Because both absorb moisture, its important to get the right cork or bamboo product for your bathroom – be sure to mention it when talking with a flooring consultant. Many of today’s products are specially treated with mold and mildew resistance, and can be anti-microbial, allergen and VOC free. Given the potential hazardous situation a bathroom can bring on, its important to choose wisely as you make your final decisions. Safety first; beauty second. But in today’s world with today’s options, why settle for one when you can have both? Stop by today and see the many options available to you.